Summer's On It's Way! Keep your Dog Safe! Now is the time to prepare for summer fun with your best friend. 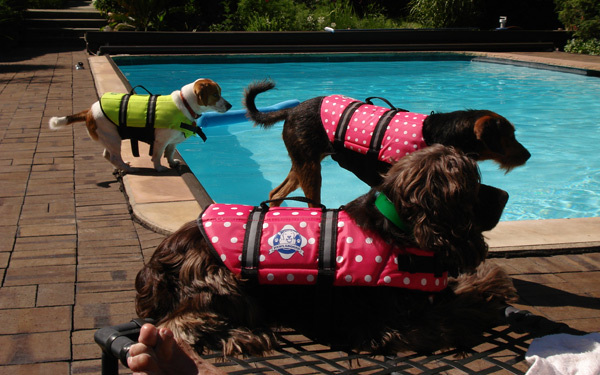 Whether you will be boating, beaching, hanging out on the dock, or by the pool, keep fido safe with this comfortable and attractive life vest. These vests are lightweight, comfortable and also make a fashion statement of your choice. Several styles and colors to choose from. Yes dogs can swim, however, they can get panicked, tired out, and even disoriented in the water. It's better to be safe than sorry. We have tried several types on our dogs and find these the best. Not only are they the safest, but also more comfortable for the dog, especially if there is a need to pluck her from the water by the handle. Other vests only have 2 belly straps which can make uneven weight distribution causing discomfort. These 2 strap models also are easier for a wriggling dog to slip out of. The design of the Paws Aboard vests have a full hook & loop underbelly giving more support and also a feeling of security to tyour pup. The pricing is very reasonable and affordable. Better quality at a better price for your priceless pet! and healthier conditions than traditional pet life jackets, which can cause heat exhaustion and chafing. Handle on top for quick and easy grabbing. Heavy-duty yet more comfortable Velcro® fastening system around the belly and neck to keep securely fastened. » Start Your Christmas Shopping now! » 4TheDogs.com now carries the full line of Fabuleash! » Coming Soon Blue Buffalo for your dog! » We now offer OTTO STEP! Safety for your dog as she travels in your SUV or Truck.